Preheat oven to 350°F. In a small bowl combine 1/4 cup white sugar and cream cheese. Spread about 2 tablespoons of the cream cheese mixture down the center of each tortilla. Spoon about 1/4 cup of the apple filling on top of the cream cheese down the center of each tortilla. Sprinkle each tortilla lightly with cinnamon. Roll tortillas up and place seam side down in a greased 8x8 baking dish. In a small saucepan bring butter, remaining 1/2 cup of white sugar, brown sugar and water to a boil. Reduce heat and simmer for 3 minutes, stirring constantly. Pour sauce evenly over tortillas and sprinkle with extra cinnamon on top if desired. Bake in preheated oven for 20 minutes. I always have lingering tortillas in my kitchen and found the perfect dessert to use those up. This dessert is super easy as uses ingredients that you might already have in your kitchen. 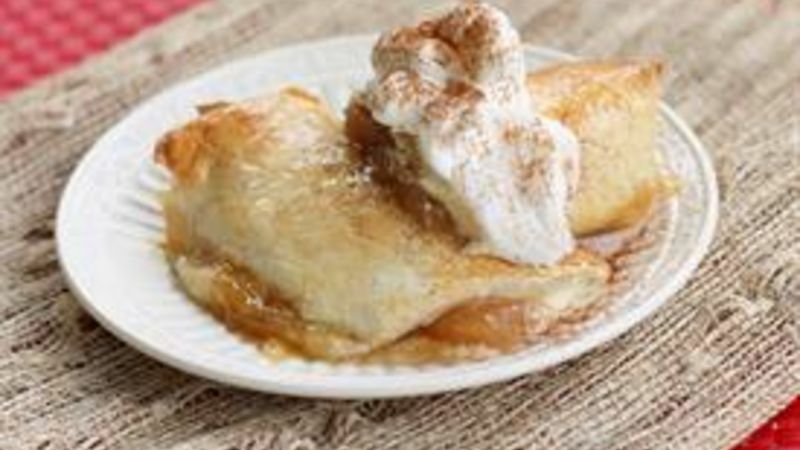 Apple Enchiladas are tortillas filled with cream cheese and warm apple filling, all smothered in a light caramel topping. Yum. All you have to do is take a tortilla and spread a little sweetened cream cheese down the center. Top that with some apple pie filling. You could use fresh apples here but then you would have to peel, core, and chop the apples and that’s just way too much work in my book! Besides, when I need a quick dessert I don’t want to have to wait for the apples to bake. Apple pie filling is already sweet, tender, and ready to be eaten in these enchiladas with a fraction of the work. The enchiladas bake in a light caramel syrup until golden brown. Don’t burn your mouth like I did trying to bite into these babies straight out of the oven. Serve them warm with a scoop of ice cream and a sprinkle of cinnamon. You will wow your friends and family with these and they don’t have to know that they were ridiculously easy! Easy! That's what these are. Apple pie filling saves the day when time is short and you need a sweet treat.